Great photo. It looks like no speedometer? Do you have other photos that show this same Mounting?? Don, They are pretty rare on a T, this is the only one i have see. I think this is an Attwood Castle generator. No speedo, Most if not all these early Fords have the big E&J sidelights. cant really tell much about this car, wish those people would move! I always enjoy the early photos -- thank you for posting them. 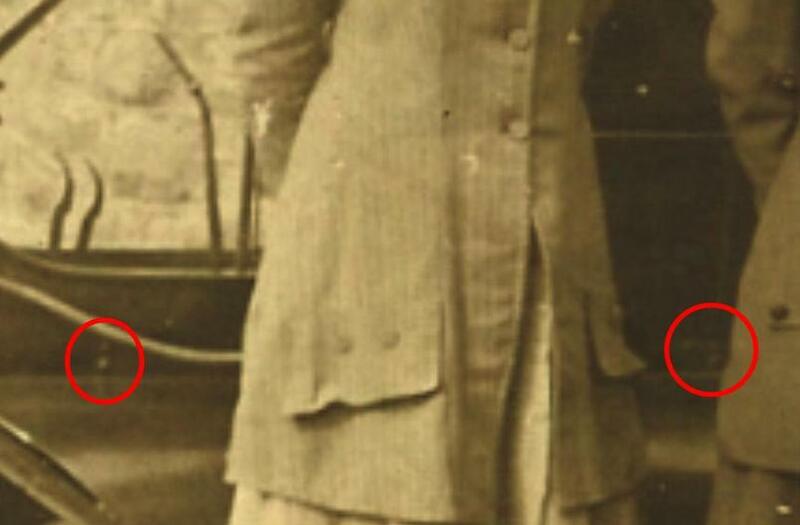 The second photo you posted with the people standing by the running board, still clearly shows the 2-levers, the 2 bolt front body mount and it also shows the center and left bolts of the "T" shaped layout of the bolts for the middle body mount -- typical of the early cars. The second photo also has the locking irons on the outside of the touring top which the car in the first photo did not have. Bruce McCalley on page 475 of his book �Model T Ford� stated �In early 1909 two types of tops were listed for the touring cars: lined and unlined. Both were apparently interchangeable.� On page 478 Bruce under car #1,153 noted �New Style Top.� And for several more it has American top or Lined top on page 478. On page 479 car 1,515 it has �old style lined top� and then on car 1,524 it has �$80 Am. Rubber top. 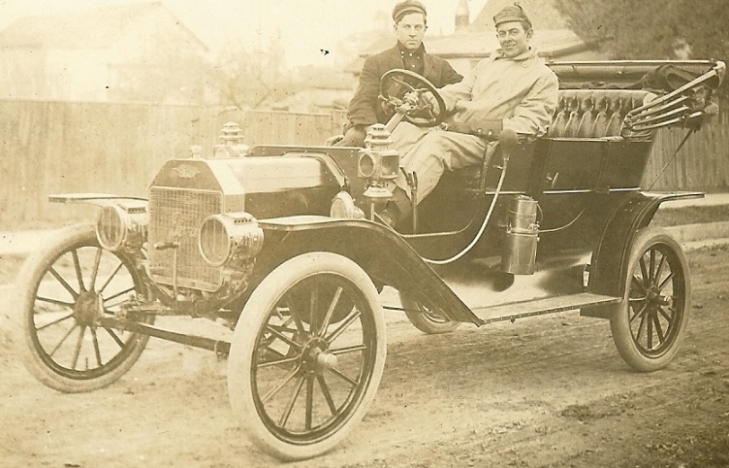 While many of the early photos of the 1909 Fords show the tops with the locking brackets on the outside of the top some show a top without those locking brackets. For example both 1909 2-lever cars initially posted at: http://www.mtfca.com/discus/messages/331880/407561.html?1386938872 do NOT have the locking brackets on the top. The water pump touring i.e. engine number 2499 or less at: http://www.mtfca.com/discus/messages/331880/406431.html does not have the locking brackets on the top. 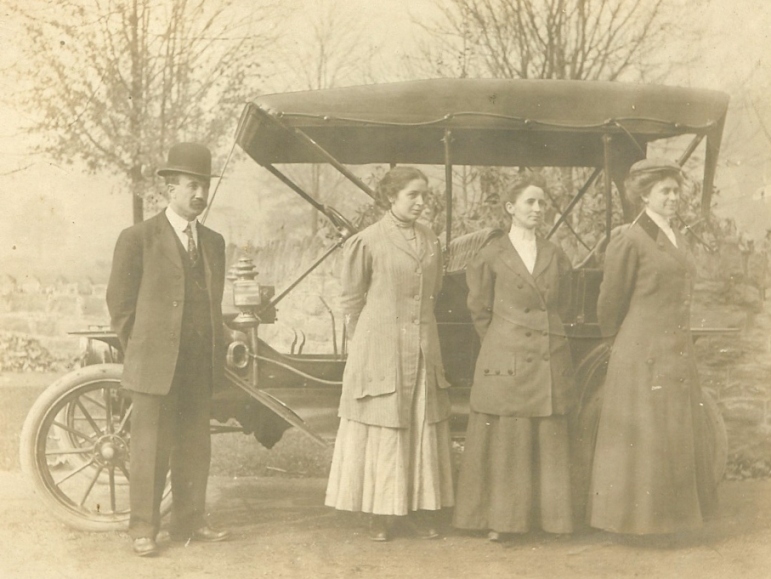 It has mentioned in several forum threads that since the 1909s could be purchased without a top or windshield, that the tops without the locking brackets may have been ordered later rather than being shipped with the car from the factory. It is an area I would like to obtain additional information about. The MTFCI Judging Standards for the 1909 tops has the comment �(Some of the first 2500 cars had a free-standing top) [ref page 3 part number 310 in the 1909 section]. I will probably ask my Santa for a copy of Gail Rodda�s �The 1909 Production Model T, Parts Guide� vol 3� which covers the 1909 cars. Perhaps it will shed some additional light on what style tops/bows/locking levers were used during 1909. Hap, I have always heard the term landau arms used in reference to the self supporting top. As far as I know there were 4 different tops used on early 1909 touring cars. American top company supplied tops in lined and un lined styles as did the extension top company. The early roadsters had gray American tops. Sr. No. 1126-1134, 1138 and 1143 all touring cars,had tops made by the extension top company. All these invoices were marked "new style top". Sr. No. 1265 had a lined extension top which is presumably the old style. Later in 1909, N. S. Jackson tops were used. I'm not sure what was meant by Am. Top rubber for $80. As always Kim is the firstest and the bestest. Thanks for posting! What holds the crank up? The crank has a spring between the ratchet and the engine front mount. There is a pawl machined into the crank bushing that mates with a reverse pawl riveted to the crank handle, allowing the crank to stow either upright at 12 noon or down at 6 O'clock position. Does that apply only to '09 Royce? How about 1910?